Our largest telescope at present is the GSO Revelation 10, Dobsonian telescope. In 2005. 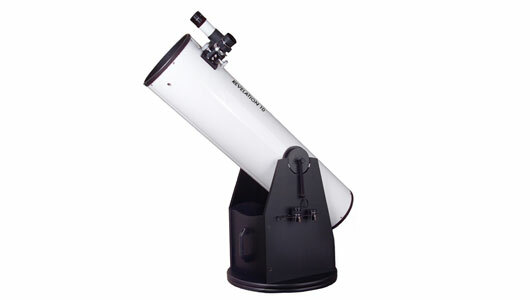 This telescope, won critical acclaim for being one of the cheapest telescopes of its type, at a very low price point. The versions of this telescope have been available in the USA for a while and have a reputation for good performance at their price point. This type of telescope is very easy to use, and with its 2 inch eyepieces of the stunning views of the night sky and other planets. This telescope is also an F5 instrument, and due to the size and weight of the primary mirror, requires a collimation check before each observing session. One of the reasons why this telescope was inexpensive compared to its competitors, was the fact that the Mirror in itself was un-coated. This offers to disadvantages, firstly, coated mirrors are able to outperform this telescope image wise, though compared to the other scopes in our fleet. It still offers a great comparison. The second issue, and for a group like us, a concerning one, is the fact that being an uncoated means it has to be carefully stored to ensure the longevity and performance of the Mirror. The latest telescopes, at 12 inch diameter can be just as light, take up less space are better made, and can outperform this basic example of a large diameter Dobsonian telescope. Once one looks through it though, all fears are set aside as you are immersed in some stunning views. Good for deep sky astrophotography (not as convenient and more difficult to use than catadioptrics). Low in optical aberrations and delivers very bright images. Open optical tube design allows image-upgrading air currents and air contaminants which over a period of time will degrade the mirror coatings and telescope performance. More fragile than refractors or catadioptrics and this require more maintenance (such as collimation). Large apertures (over 8") are bulky, heavy and tend to be more expensive. For portability 150-200mm are best at f/4-f/8. Generally not suited for terrestrial applications. Dobsonian's have their place if you know the sky, love deep sky object's and are just happy to roam the stars. The newest designs are even more portable, and even have adapters to fit small digital cameras. It is possble to add motors to this type of telescope so tacking is possible, this it is not yet available commercially. One upgrade for the dedicated souls out there. In summary a Dobsonian is the best general purpose telescope for those that are happy to roam as they are good on all types of objects and for starting (basic) astrophotography. Bang fro buck, Dob's offer more aperture than a refractor, but do require more care, as they can require more collimation (alignment of the mirrors) which is quite easy and only takes a minute or two with a bit of practice. If you wish for the ultimate deep sky telescope, and also a scope which is oh-so-simple to use, then look no further than a Dobsonian.